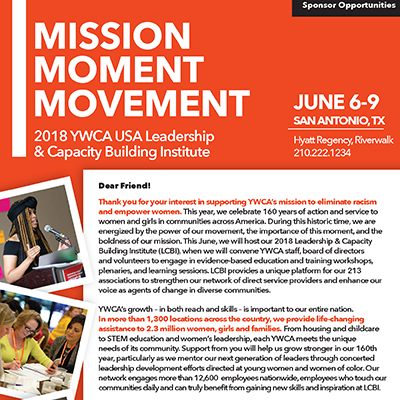 The Leadership and Capacity Building Institute is a unique opportunity to partner with 213 YWCAs from local communities across the US. For 160 years, we have worked to eliminate racism, empower women, stand up for social justice, help families, and strengthen communities. We invite you to invest in real and lasting change for the more than 2 million women, children and families we serve. With your help, we can continue to address the most pressing social movements— from voting rights to civil rights, from affordable housing to pay equity, from violence prevention to health care reform, learn how you can make a difference.